Throwing a baseball puts a lot of stress on the elbow. During the throwing motion, the Medial Collateral Ligament is stressed by tension, and the outside of the elbow is stressed by compression. Repetitive compression of the outside of the elbow can injure the bone in this area, interrupt its blood supply, and cause part of the bone supporting the outside of the elbow (the capitellum) to die. This is analogous to a ‘heart attack’ of bone, and is called Osteochondritis Dissecans (OCD). During a heart attack, blood is cut off from the heart, killing part of it. During a stroke, blood is cut off from the brain, killing part of it. When the blood supply is cut off to a bone, part of the bone can die, which is called OCD. OCD of the elbow causes pain, swelling, and stiffness. Up to 50% of the time OCD leads to persistent symptoms and arthritis. In addition, the dead bone and cartilage can break off and form loose bodies that lead to painful locking and catching. It’s a very serious problem. The best way to treat OCD is to treat it early. Early on, before the dead bone has broken off and formed loose bodies, OCD can often be cured by simply resting the elbow. This means no throwing, no using the arm to bear weight, and no heavy lifting for 6 months or more. If rest fails to resolve the symptoms, or if the dead bone and cartilage has fragmented and formed loose bodies, Elbow Arthroscopy is often very helpful. 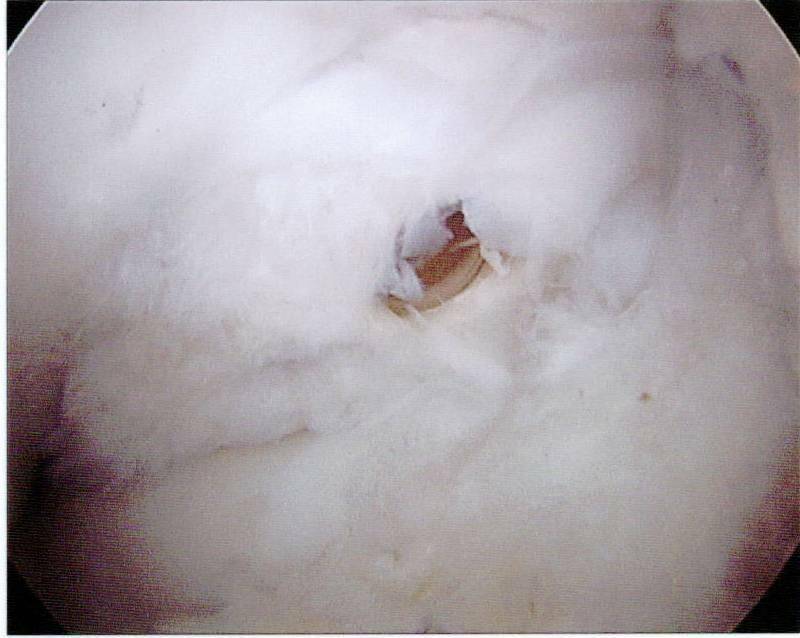 If the OCD lesion has already broken off from its bony crater, Elbow Arthroscopy can remove the loose bodies and smooth down the loose cartilage edges of the OCD’s crater that can get caught between the elbow bones during motion. In addition, ‘Micro-Fracture’ or drilling can be used to treat the OCD crater. This is similar to what many professional athletes have done to focal areas of arthritis in their knees and ankles. A sharp angled awl is used to punch small holes in the affected area of bone to hopefully stimulate a healing response that can lead to the production of new cartilage. Alternatively, a sharp pin can be used to drill these holes. While the new cartilage formed from Micro-Fracture or drilling is not normal, and not as good as natural cartilage, it is often good enough to stop the pain, swelling and slow down or halt the progression to arthritis. Early motion is encouraged after Micro-Fracture surgery to help the newly forming cartilage to mature. Heavy elbow use is not allowed for 6 months. If symptoms persistent for over 6 months following surgery, if the OCD lesion is large, or if the outside rim of the capitellum that helps stabilize the elbow joint has been destroyed by OCD, then a second surgery is often needed. In this procedure, living bone and cartilage is taken from the outside of the knee and placed into the elbow defect created by the OCD. 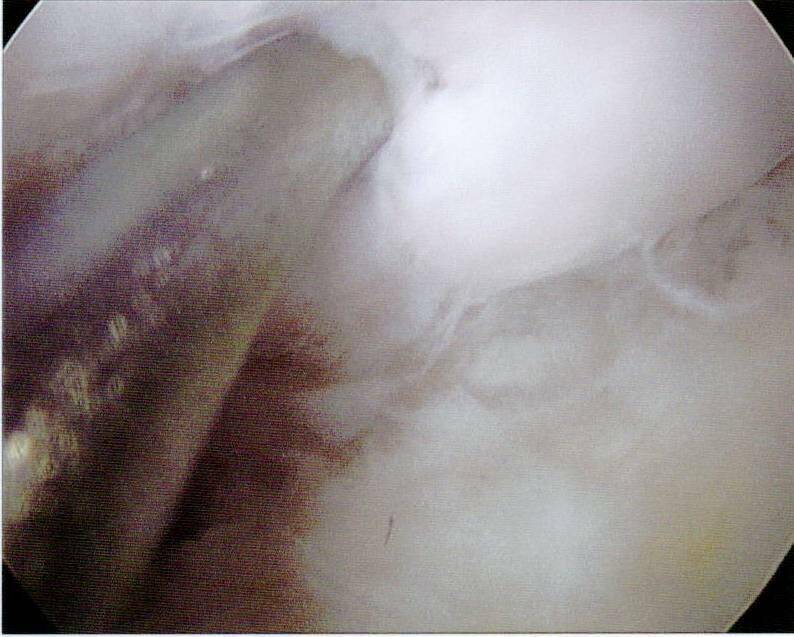 The hope is that this transplanted bone and cartilage will heal and allow the elbow to function normally. If not, the natural history of OCD is that 50% of patients will continue to have pain and swelling and go on to develop arthritis. Without question, the best treatment for OCD is prevention. Parents, protect your teenage pitchers. Follow the pitch counts religiously. Rest painful elbows. Otherwise, many of the best pitchers will have their careers ended due to injury before they graduate high school. Remember: teenage athletes are more vulnerable to overuse injuries than adult athletes. A little patience and rest in the short run can prevent the premature end of a promising career and chronic elbow problems in the long run. 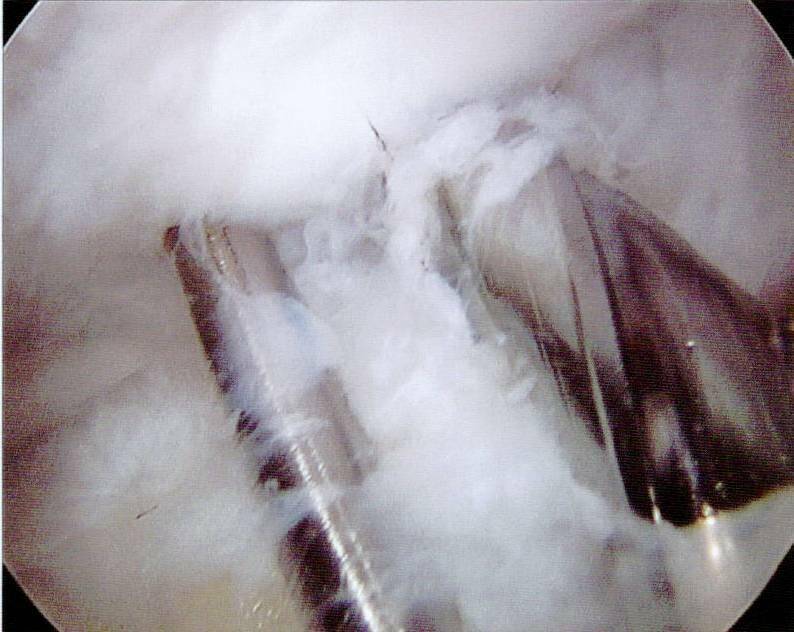 OCD lesions that have not fully broken off can be fixed arthroscopically. The crater beneath the OCD lesion, that the dead bone has broken off from, is curetted to stimulate healing (Figure 8). In OCD fragments large enough for screw fixation, a metal pin is temporarily placed to stabilize the lesion in place while a hole is drilled for a bioabsorbable drill (Figure 9). 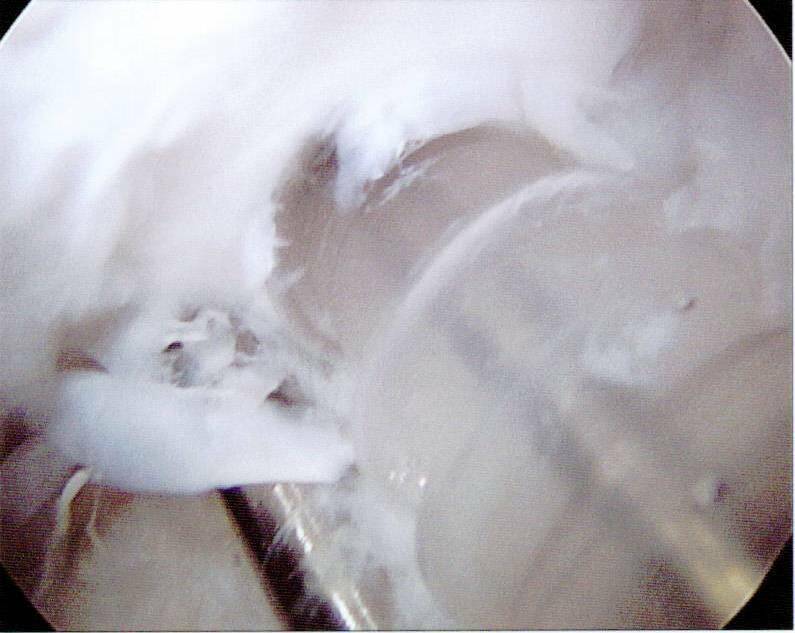 A bioabsorbable is placed to fix the OCD lesion back to its native bone (Figure 10). The metal pin is then replaced with a bioabsorbable pin for rotational control. In many cases both a bioabsorbable screw and pin are used to stably fix the OCD fragment (Figure 11).